Quick: when you need to describe SharePoint to a colleague, what words do you use? If you’re asking me, I can almost guarantee that the word “collaboration” comes up. This is no accident; Microsoft used that word for years to describe SharePoint, and now Office 365. It’s a “collaboration platform”. 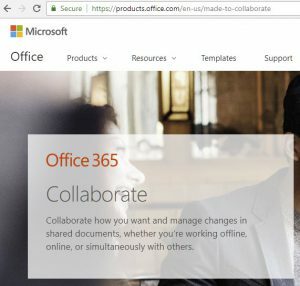 There’s even a web page for Collaboration on Microsoft.com regarding Office 365. Collaboration is a fancy word that really just means “working with others”. It’s a nice reminder that in general, our work is rarely carried out in a vacuum; we are often graded on our effectiveness and efficiency in completing tasks with other humans. And software isn’t meant to exist in a vacuum either; software isn’t there to collaborate with other software (although in an intermediate sense it might); ultimately, software’s value is also based on whether it makes people’s lives better. Microsoft is advertising that Office 365 can do just that by helping you do your job with others in a more efficient and seamless way. Identity why you feel the need to say yes to everything. If you like the feeling of being helpful, or you like checking things off of lists, identify that. Instead of embedding yourself in everything, making yourself indispensable for the sake of being “helpful” or a “team player”, instead make every effort to encourage a team effort; try to highlight the efforts of others and take the focus on you. This both lets others shine and takes the pressure off yourself. Set expectations that if you aren’t johnny-on-the-spot anymore, it’s not personal; it’s just that your priorities are getting realigned. Many successful executives have started pushing back on the generally accepted one-hour block of meeting time. Whatever time someone asks for, the executives ask for half. Other executives (based on the above-mentioned article) are more adamant about asking only to be called in for the relevant part of the overall meeting instead of being asked to sit through the whole thing. 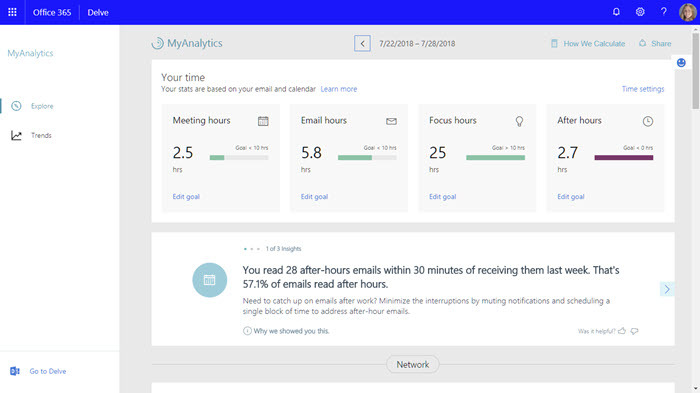 MyAnalytics can let you see the average meeting time, so you can make a goal to reduce that amount of time. Conversely, studies have shown that people work better when they can actually focus on one thing at a time without constant interruptions. 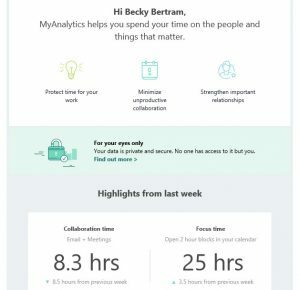 MyAnalytics states that “two hours without meetings count as focus hours”; it will show you a graph indicating how many focus hours vs meeting hours you have each week. Each week, you can get an e-mail that gives you summary information regarding the previous week’s activity. If you navigate to the dashboard, you can get more detailed information. MyAnalytics is currently available for $4/user/month or with E5 subscriptions. Keep in mind that while this functionality might not be necessary to everyone in your organization, if it helps improve efficiency and focus among a few select individuals, you can buy it as an add-on subscription for just those people who need it and the $48/year will most likely pay for itself with increased employee performance. Clearly, MyAnalytics doesn’t actually solve your collaboration overload problem; that is mostly up to you! But having a reporting system that you can use to track metrics can help you make goals and meet them so you can focus on bigger tasks and keep the “life” in work/life balance. “Introduction to SharePoint Online” Course from Opsgility Now Available!